The BVI Football Association brought the curtains down on the 2015 High Schools Soccer season on Thursday afternoon in Greenland, with an exhibition game and doling out of awards to the respective division champions—Elmore Stoutt, Cedar and Bregado Flax High Schools. Before the presentation of awards, Elmore Stoutt High used a brace of goals from Phillip Jules and Timothy Lewis, to best U15s champions Bregado Flax, 3-1. Makimbo Demming scored for BFEC. ESHS went through the league unbeaten to claim the title in the Open Division. 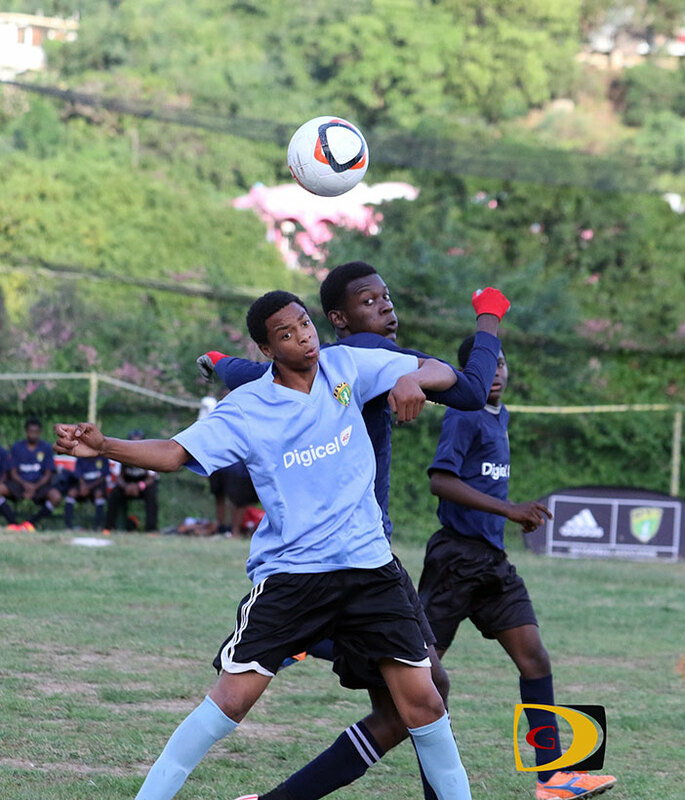 They began with a 3-1 victory over BFEC, which was followed by a 2-1 win over St Georges. In a rematch, ESHS again bested BFEC, this time 2-1, on two goals from Phillip Jules. Cedar School thrashed SDA 7-0 with Leo Forte notching four, but was then not available to play for the rest of the campaign and ESHS wrapped up the title with an 8-0 win over SDA, with Jules netting a hat trick. BFEC went unbeaten throughout the season to lift the title in the Under 15 Boys Division. BFEC’s Khemron Tillack kicked off play with a hat trick in the 4-0 victory over St Georges. Then, Luca Reich of Cedar White went one better and scored four in a 7-1 demolition of ESHS. However even those goal scoring feats were outshone by Devante Samuel who scored five for BFEC in the 9-0 thrashing of Cedar Green. Cedar White went on to beat SDA, 4-1 with Luka Chalwell getting in on the multi goal scoring fun, notching all four and then registering a hat trick in his side’s 7-0 win over their school mates. Not to be out done, Kyreek Gardiner smashed four goals as BFEC rattled up a 10-2 victory against SDA and Miquel Marshall grabbed his own hat trick for ESHS in a 6-1 win over Cedar Green. MVP went to Michael Woodley, the Golden Boot Award to Luka Chalwell and the Golden Glove to Daniel Gilford. Cedar School were the women’s division championship with 12 points, to finish ahead of BFEC who had nine and ESHS with 6. Cedar’s Tinia Van Zoost was the league MVP whiled the Golden Boot award went to Lilly Pierce and the Golden Glove recipient was Chinara Perry of Seventh Day Adventist. Marlina d’Anguiar also of SDA was named as Most Improved Player. In what would have been the most crucial game of the season turned into a disappointing affair for ESHS, as they forfeit to Cedar after not having enough players to complete the game. Cedar went on to stamp their authority on the league with a 4-2 triumph over BFEC, which included goals for Olivia Messum, Alisha Looney and Lilly Pierce. Pierce added a five-goal salvo against Claudia Creque and wrapped up the league championship with another hat trick in the 8-1 win over SDA, in a game that also included a hat trick for Ella Brownsdon.